Here's some of our Friends, Associates and other photos. As time goes by there will be a lot of stuff on this page. Have another look every now and then. Carissa of Colorado took exception to our characterizing Patterdale Terriers as not a good choice around kids or cats and sent this photo (below) to make her case. 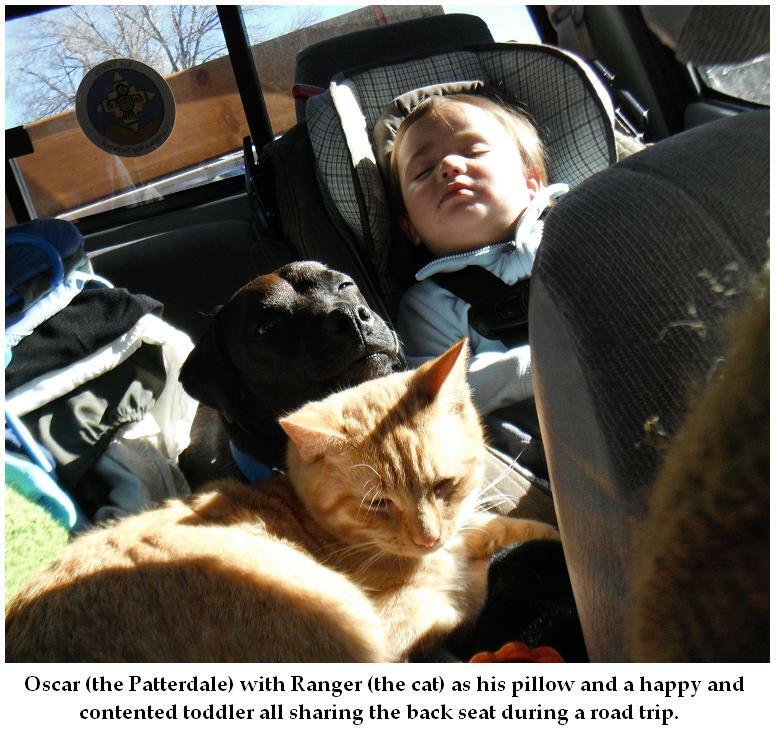 She says she has complete confidence in Oscar and that he's an excellent co-pilot. Awesome photo! Thanks Carissa! Oscar is a great ambassador for Patterdale terriers. Adam's a good guy that doesn't mind working with his Patterdales. He stays busy so his page will grow slowly but steadily. Check back occasionally for updates. To view some photos from Hurricane Kennels (in Sweden) click here >>> Hurricane Kennels . These are great guys and they breed top quality dogs for the real thing. Check 'em out. Tim drove up there and had a look and now we're making plans to get some of that blood on our yard! We only have a few photos (for now) but there will be much more to show and tell as time goes by. Click here, >>>>> Patterdales of Erie, Pa. for a look at some very pretty and very-real Patterdales! In Oklahoma they have a tradition of producing great performance dogs of all kinds. We've wanted to feature this kennel for some time and finally got permission to do it. Click here>>>> Jinx's Little Bullies to see Some really cool and well-bred little dogs! Before y'all make any wild assumptions...NO! These dogs are NOT being bred into ours. We just think these are cool little dogs and our friend allowed us to show them off for him. That's all that's going on here. 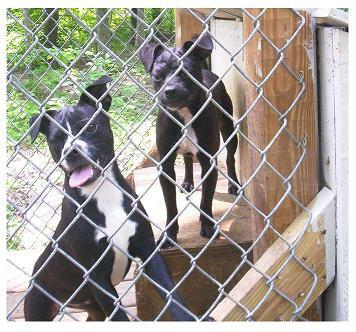 This is Millie on the left and Pixie on the right shown at 8-months of age. They are littermates from the 3rd litter of Pebbles & BamBam. Pixie stayed in our program and her details can be found elsewhere. This picture (above) underscores the variation in looks and colors that can occur when Patterdales Terriers are bred for performance without regard for their appearance. 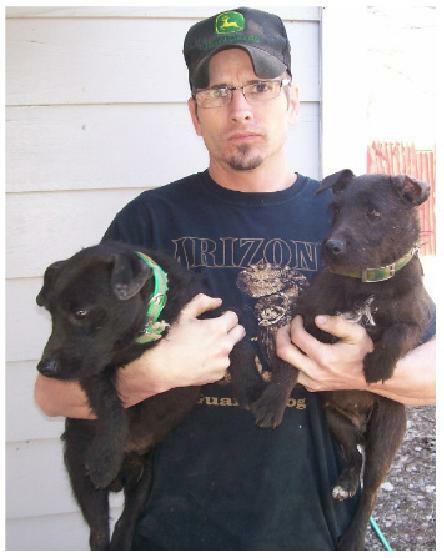 Here is Jason Nagy (of Michigan) with two good Patterdales. Jason is very serious about working his dogs. We hope to see and hear more from him [and his dogs] as time goes by. This little gal is sporting one of the coolest color schemes we've ever seen. 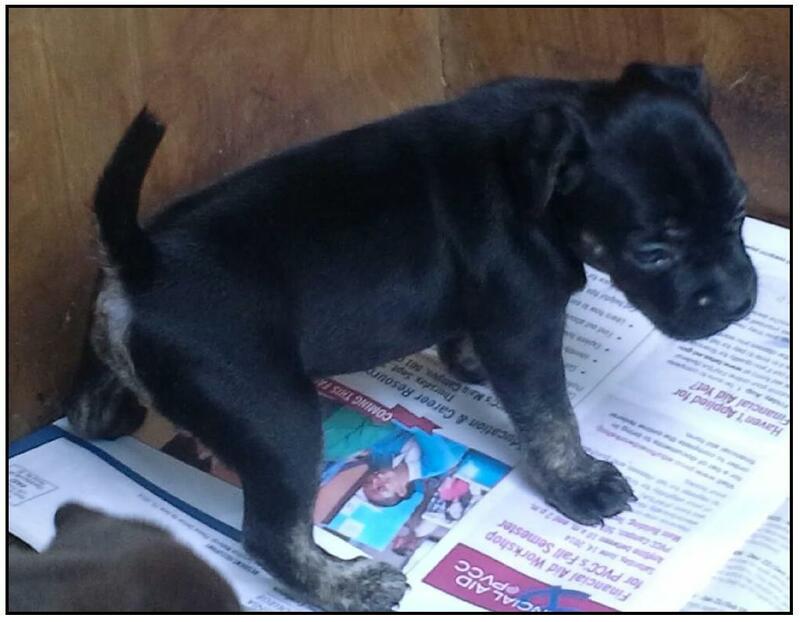 Black on top and blond-brindle on the undersides which include her lower legs, cheeks and bottom jaw. She's from the 1st litter of Maxine and BamBam which makes her a "maxi-bam" dog. We call her "Bad-Brandi" and her details will be shown elsewhere when she's more than just another pretty face.